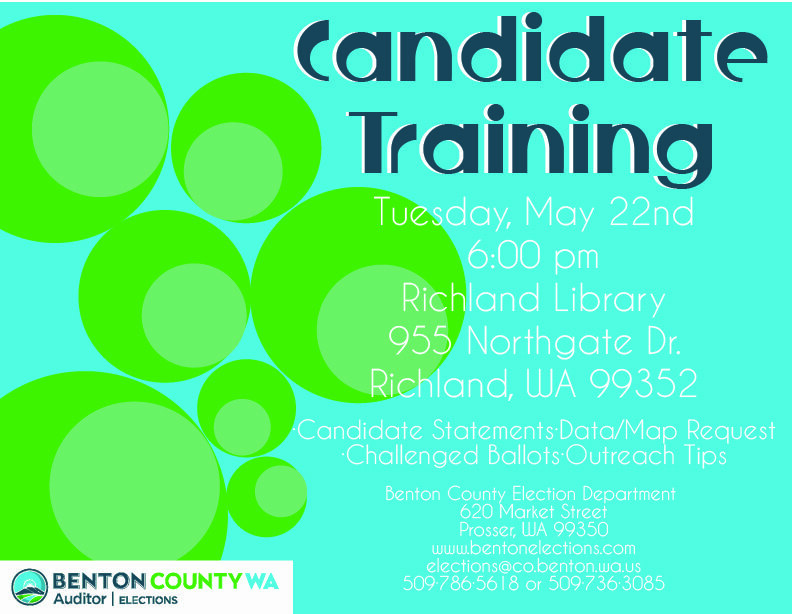 Candidate Training: The 2019 candidate training will take place on Tuesday, May 21 at 6:00 pm at the Prosser Election Department. The Secretary of State accepts candidate filings for federal and statewide executive offices, and for any legislative, court of appeals, and superior court office serving more than one county. The Benton County Auditor's Office accepts filings for all countywide and local offices. 5/13 First day to file a declaration of candidacy. 5/17 Last day to file a declaration of candidacy. 5/20 Final day to withdraw from the ballot. 5/24 Deadline for submission of Voters' Pamphlet statements and photographs. 12/15/17 Last day to file a resolution for 2018 February Special Election . 2/23 Last day to file a resolution for the April Special Election. 5/11 Last day to file a resolution for August Primary. 8/7 Last day to file a resolution for the November General Election.